I went along to the first few hours of the Hurt for Haiti Event in Bentley's Courtyard. All I can say is that it was an amazingly well organised and run event. Loads of the voluntary committee and members from the Red Cross on hand to ensure that everyone in attendance had a great time. All credit to the people behind the event who gave so generously of their time and talents for such a good cause. The Music was also excellent and my only regret is that I could not stay longer! As the photos below will show it was a very Family friendly event and I am sure as the evening progresses a great time will have been had by all! All money raised from the Love Haiti event is going directly to the Red Cross and will help those affected by the earthquake in Haiti. Click on any photo to view on our Picasa web album, All photos are free to download. A very well organised day and evening is in store tomorrow in Limerick and we encourage everyone who can to attend. As detailed below there will be loads to do hear and eat! with things to do for young and old alike! I will be going along and will post up the photos on our Munster Images Section and will add the slide show to this post also. Find Hurt for Haiti on Facebook and show your support! Description: Local musicians, chefs, and entertainers are staging a major city centre event to raise funds for The Irish Red Cross efforts in Haiti. Over five floors of music, food and fun will be hosted by Bentley's, The Brazen Head and Isaac Taylor's. All procees will be donated to The Irish Red Cross effort in Haiti. Local musician's, chefs, entertainers and more will lend their talents to this day long fundraiser event, which kicks off at 3pm. 'We're delighted to welcome children to the specially organised kid's activities in the afternoon, and of course, the adults will be well catered for until the wee small hour's. Throughout the day there will be a barbecue buffet with specially prepared foods and tempting delicacies and even a pig on a spit! A top floor healing space offering relaxing massages, and appearances by local comedians, personalities and maybe even a celeb or two!! From 3pm, we will be using The Courtyard of Bentley Barkers as the main stage for the day. From 6pm, The Brazen Head will open it's doors and house more great bands, such as The 54 Club and Joe Browne and The Durty Dawgs and The Half Yards. From 7pm, The upstairs piano bar in Bentley's will open up, Nick Carsewell will kick start proceedings and give way to Steve Hanks and many other Jazz cats throughout the night. From 9pm, Issac's Bar downstairs will start hopping to the sound of Limerick most well respected DJ's, The Roots Factory crew, Paul Tarpey, Tokin White Boy, DJ Lenny and Jon Greenwood to name a few. From 3pm , On the top floor of Bentley Barkers, there will be a space dedicated to relaxing in a calm environment with Acupucturists,and range of complementary Therapists, including sports and Thai Therapists, on site and even a Sitar player. When the healing is done and the good vibes have all been dispersed, a troupe of Traditional Irish Musicians will take over the top floor and get a good old session going! As all this going on there will be plenty going on around the venue, a balOOon artist, face painters, and even a fire breather~!! All proceeds from this event will be from donations and will all go to The Irish Red Cross to help with their efforts on the ground in Haiti. The situation there is worse than anything we could imagine and the people of Haiti need all the help they can get. This is our contribution. They have approximately 90 designer wedding dresses and a selection of bridesmaids dresses also. These dresses will range between 150-250 euro. All proceeds of this event will go towards the continued support of the charity organisation, Enable Ireland. SpeakeasyJazz Limerick is hosting a one off, extra gig this month. We wouldn't normally do this but the circumstances call for it. 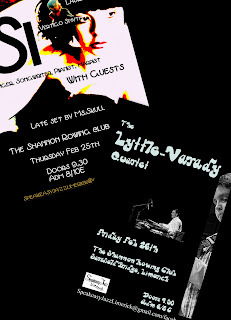 On Thur Feb 25th, We are delighted to have the very beautiful Sí gracing the Shannon Rowing Club. The club will prove the perfect venue for this bewitching songstress. Sí is a singer, songwriter, harpist and pianist originally from Dublin but now living in Limerick. Her songs are sad little things about life, love, heartbreak and all those kinds of things. Sí has been gigging around the place for a while now and is currently recording her debut album with Fergal Lawlor from The Cranberries, due to be released in early summer. Sí's guests on the night will be Laura Sheehan and Vertigo Smyth..
Laura Sheeran is a 22 year old solo artist based in Dublin. Her musical path began at the age of 15 when asked by friend Clodagh Simonds (Mellow Candle, current 93) to do some singing for a then embryonic project later to be known as Fovea Hex. Since then she has continued to sing with Fovea Hex in the studio and also for live performances (where she plays accordion and bowed saw also) along-side Cora Venus lunny (ICC ensemble, Yurodny) Kate Ellis (Crash ensemble) and Michael Begg (Human Greed). Other contributors to this project include the likes of Roger Doyle, Brian Eno, Roger Eno, Robert Fripp, Percy Jones, Donal Lunny, Andrew Mckenzie, Matmos and Steven Wilson. Laura's solo music is highly atmospheric, lending itself well for use in theater and other visual media like film. over the past few months Laura has been putting the finishing touches to her debut record which has developed into a double album. in making this record Laura explored various musical places, deciding early on that she would abandon the idea of writing with piano or guitar she has been experimenting with many instruments she would never before have written for, for example the harp, flute and accordion. She also had a lot of fun writing for strings and of course did a lot of vocal experimentation. Entitled 'lust of pig and the fresh blood' the album is due for release this year. Straight out of Ennis, comes Vertigo Smyth. This is normally a paragraph where you find out about Vertigo Smyth. However, it has proven quite difficult to get any useful biographical data out of the man. We know for certain he is from Co. Clare and is an Aries. There is strong anecdotal evidence to suggest that he now resides in Limerick, or perhaps Clare, or even Galway. Not much is known about his musical background but it is understood that he came quite late to music and music making. In the past few years he has supported such acts as Mick Flannery, Cathy Davey, Gemma Hayes and Juana Molina. On his recorded material he is credited with guitar, banjo, ukulele and keys but has been keen to stress that; "There is a difference between owning a multitude of instruments and being a multi-instrumentalist". He writes all his own material but finds ironing his own shirts quite a struggle. Later in the night when the live music has been all played away, Ms.Skull will be waiting to take off, in her own particular fashion on the decks. Ms.Skull has a very broad repertoire of music and is eminently skilled at getting the room moving in time with the tunes! As an extra one off gig, we would like to present 'The Lyttle Varady Quartet'! On Frid Feb 26th we would like to invite you to listen to the sounds of David Lyttle and Andreas Varady. Andreas Varady is twelve years old and hails from Slovakia. This young man is an anomaly. Andreas' dad Bandi, put a guitar in his hand first when he was two years of age and he hasn't looked back since. Andreas has a talent that has to be seen and heard to be believed. It's out of the ordinary to see such a young man play with this great musicianship, tone and technique, and still have a strong sense of his own artistic expression, not to mention he loves it! Taking influence from such greats as Charlie Parker and George Benson, Andreas plays regularly with The Limerick Jazz Workshops and continues to amaze as he plays to a standard that takes most people years to achieve. David Lyttle is a Jazz drummer based in Ireland. Self-taught on the drum kit since the age of eight, Lyttle also received classical training on cello but began to focus his efforts towards the drums in his late teens after taking a serious interest in jazz. Lyttle has worked professionally in the US, Canada, Britain and Europe, with a wide variety of internationally-respected artists. In the Jazz world, these include Greg Osby, David Liebman, Jean Toussaint, Soweto Kinch, Matt Penman, Dave Allen, Jamie Baum, Jonathan Kreisberg, Louis Stewart, Robert Mitchell, Jacqui Dankworth, Ronan Guilfoyle and Michael Buckley, who features on 'True Story', Lyttle’s acclaimed debut album on his ‘Lyte Records’ label. We'll soon be able to add Andreas Varady to that list. Andreas and David will debut at The Shannon Rowing Club in late February. Playing with them on the night will be Martin Bencat~Double Bass and Bandi Varady~Bass. It promises to be a stunning evening of stimulating and first class Jazz, you won't want to miss this one! The Carlton Castletroy Park hotel will be host to a wedding fair extravaganza on Sunday the 21st of March between 12pm and 6pm. There will be two catwalk fashion shows loads of prizes including a chance to win your honeymoon! The show will be hosted by Andrea Roche and Lisa Cannon from Xpose. There will also be a wide range of exhibitors of other services for your wedding from Wedding Photography to Wedding Cars etc there will be lots of special offers for those who attend. The Carlton Casteltroy Park Hotel is now under new management the hotel was taken over by the Carlton Hotel Group In February 2009. 4* hotels around the country three of which were added to their impressive portfolio in 2009. ALJEFF Movie Theme Party - A Great Success! The ALJEFF fundraiser was on tonight at the Pery's Hotel. It was a Fancy Dress Movie Theme Party, which was organised by the Event Management class of the Limerick College of further Education with the help of Fran O Donnell from Futureama Productions. Music was provided by Local DJ Richard Smith. ALJEFF is a treatment centre for addiction based in Limerick city. Tickets for this event are Eur 15 and available at the Pery's Hotel, Glenworth Street, Limerick, or on the door at the night. Online shops for anything party related. From Balloons to party pinatas and decorations for all seasons and any major event. They have just added a selectionof new decorations and Balloons for St. Patricks Day and also decorations for Communions and Confirmations. Also if you are looking to run a Themed party for your kids they have a range of Party Packs wih everything you need for 10 or 20 Kids at one all inclusive price. They carry packs for a Hannah Montana themed party or a Ben 10 Themed Party and even a Highschool Musical Themed Party! Check out the website for your self to see the range of products on offer at excellent prices! The earthquakes in Haiti have killed an estimated 110,000 men women and children. Countless amounts of people have been left homeless and without food, water or anywhere to turn. The disaster is an abomination, and although we can't change what caused it, we can help a little with the consequences.We're going to hold an event in Limerick that will involve food, music, dance, performance and sport. We have people from every strand of society working on this, and so far nobody we've approached has paused for a millisecond before saying yes. The generosity of people is simply stagggering. The event will be an all day family friendly affair with entertainment for smallies as well as grown ups! We will be taking over Bentley Barkers~upstairs, downstairs,the outdoor area at the back, and The Brazen Head next door. There's a massive amount of space to fill and we will be filling it with some of Limerick finest Musicians, Djs and performers. We will be giving 100% of all takings to The Irish Red Cross.The Red Cross in Ireland is working closely with its staff in Haiti to ensure that emergency supplies are delivered to those coping with the disaster in the most efficient way possible.Noel Wardick, Head of the International Department, Irish Red Cross explained, "Red Cross teams in Haiti have been working since the disaster struck to provide tarpaulins, tents, blankets, hygiene kits, kitchen sets and jerry cans to almost 13,000 people, as well as distributing more than 2 million litres of water in Port-au-Prince and Leogane. Another 40,000 people will receive relief items in the coming days. "The Irish Red Cross announced this weekend that it had raised over €1 million in its Haiti Appeal thanks to the Irish public’s generosity in the wake of the disaster. However, funds are still urgently needed.This is a very serious situation, the people of Haiti will need help for a long time to come. We need to step up and offer something significant to them, not spare change from the bottom of your pockets, something that will hurt you a bit. There is a Fundraiser this Saturday (6th February) evening ( doors open at 9 pm). It is a Fancy Dress Movie Theme Party, which has been organised by the Event Management class of the Limerick College of further Education in aid of ALJEFF, which is a treatment centre for addiction based in Limerick city. Tickets for this event are Eur 15 and available at the Pery's Hotel, Glenworth Street, Limerick, or on the door at the night.